It was far from just another day at the office at Under Armour's Baltimore headquarters on Wednesday after NBA superstar Stephen "Steph" Curry walked in. Curry joined CEO Kevin Plank to announce he's upping his partnership with the company by designing training programs that Under Armour will add to its Connected Fitness apps. Curry is already visibly tied to the company. He wore Under Armour (UA) shoes on his way to winning the 2015 NBA championship and the MVP award. Curry has a footwear line with the company and his first shoe, the Curry One, "has continued to almost fully sell-out across all retail distribution channels," Under Armour said. The deal with Curry will keep him busy marketing his products year-round as Under Armour looks to make the shoe available in more foreign markets. 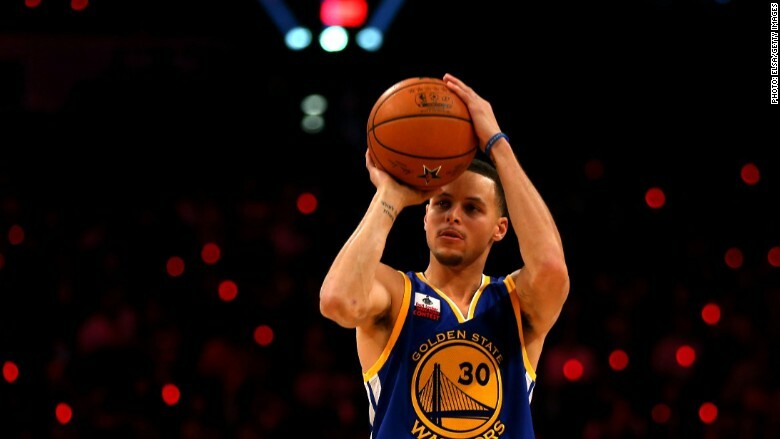 "The partnership also extends marketing rights to Asia, allowing Under Armour to promote Curry and other athletes on its NBA roster in greater China using NBA uniforms and league marks," Under Armour said in a statement. Under Armour said the deal is the company's latest example of its "fast-growing momentum in basketball." It landed a new, 10-year partnership with the NBA in August. It's going head-to-head with Nike (NKE), which currently controls about 90% of the basketball shoe market. But branding the sport's MVP has made a big difference. Under Armour has been sizzling since Curry became the face of its footwear line, and the company expects year-to-year revenue to grow 25%.